Jesus Chris Superstar Live in Concert was simply divine! 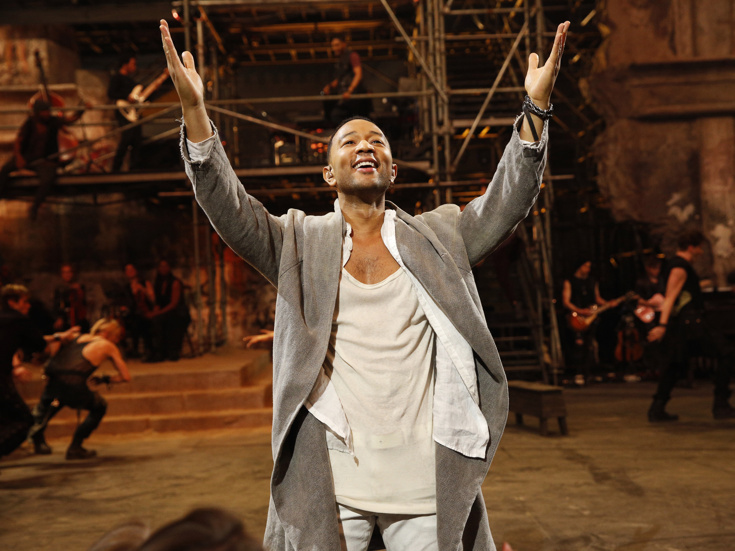 Though the live musical did not reach as many people as Dorothy and her friends or the von Trapps (NBC's The Wiz and The Sound of Music still hold the crown, with 11.5 million viewers and 18.6 million viewers, respectively), the NBC broadcast, starring John Legend, Sara Bareilles, Brandon Victor Dixon and more, tied with 60 Minutes as the evening's top show, reports The Hollywood Reporter. The performance won out with nine million viewers, beating ABC's American Idol, averaging a 6.0 overnight rating among Nielsen's metered market households. This was far better than Fox's previous live musical, A Christmas Story Live!, which brought in 4.5 million total viewers, fewer than all of its live musical predecessors, including Hairspray Live!, which also brought in nine million, and Grease: Live, which saw 12.2 million. Forthcoming live musicals audiences can look forward to include NBC's in-the-works Bye Bye Birdie Live and Fox's Rent Live, scheduled for January 27, 2019.